Forty-five minutes from the nearest stoplight at the end of a towering canyon sits Telluride, Colorado (elev. 8,750′), a National Historic Landmark surrounded by the highest concentration of 13,000′ and 14,000′ peaks in the United States. Above the historic mining town of Telluride is a modern mountain village connected by a free pedestrian gondola, the only one of its kind in North America. While the ski terrain is world-renowned, the resort is truly defined by a collection of unique, intimate and unmatched elements. From the exclusivity of the Tempter House to the luxurious cuisines and wine selections of Allred’s and Alpino Vino, you’ll find these experiences are as one-of-a-kind as the San Juan Mountains that surround them. 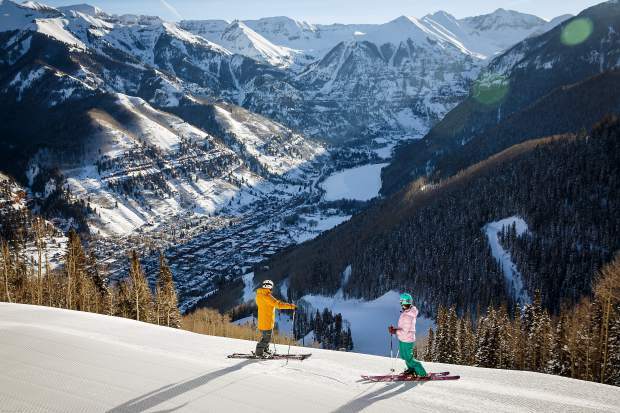 Unlike any other resort in North America, Telluride’s location and size allows guests to revel in a peaceful atmosphere, where lift lines are nearly non-existent and the people are authentic and friendly.